I updated this chart yesterday. It isn't perfect, but it's darn close (sources: Bureau of Labor Statistics, Corvette Black Book, Chevrolet). Note the pricing peaks for base coupes and base convertibles in 1989. JOHN, THAT IS A VERY INTERESTING CHART! A few years ago I used an online site to estimate what my 1989 would have cost new. I was shocked when it came out to about $39,000 back then! None of this impressive equipment and capability came at all cheap. 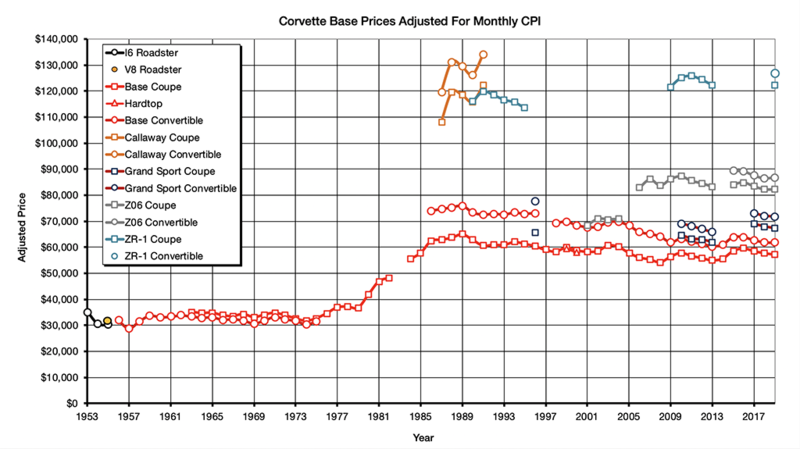 Despite being Chevrolets and thus theoretically part of the Detroit manufacturer’s traditional “low-priced three,” Corvettes have never been inexpensive cars. When they debuted at $3,744.55 in 1953—a lofty and aspirational price when every other Chevrolet model’s base price was between $1,524 and $2,273—the first Corvettes cost as much as or more than some Cadillacs, Lincolns, Packards, and Porsches of the day. Eighties Corvettes were even pricier in constant dollars—Lauren’s base price with destination charge was $24,878 (approximately $57,800 in 2017 dollars). 1. My 1992, bought in 2000, cost $16,900.00. 2. My 2006, bought in 2017, cost $23,000.00. At the time of the purchase of the C6, the adjusted for inflation price of my 1992 was $23,750.00.